So I pre-wrote my blog for today yesterday, knowing that I would be running around with guests arriving this morning. But I have just read something in Folha de São Paulo this morning that has left me "indignada" or indignant. No, "indignada" is stronger than its English translation--I am shocked at people. Every day. The story is about the exciting conclusion to an ongoing battle between the government and some squatters. The government has a program for public housing called "Minha Casa, Minha Vida" (My House, My Life) which I will go into at some other moment when I am not so indignant. Basically the government is building low cost housing -- if you make less than R$5000/month (more or less US$25,000/year), the government will subsidize the purchase of one of these apartments. If you make less than US$10,000/year, you get even more help. 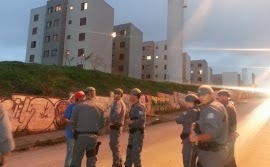 So in Itaquera, in the east part of this giant city, squatters invaded almost-ready apartments and refused to leave. This was in July of 2013. Since then, efforts have been made to negotiate an end to the stand-off--while these apartments were promised to other low-income folks, the squatters were promised other soon-to-be-finished places. Yesterday the police ejected the squatters. It was the usual horror of rubber bullets and blockades of furniture etc. Kids missed school so they could help their parents cart their furniture and TVs out. And then the squatters set fire to the apartments and threw out plumbing fixtures onto the street, making the place completely uninhabitable by others. One squatter is quoted saying "If it's not me that's going to live here, no one will." This attitude makes me sick. The people who were supposed to have these apartments waited for years to get them. They followed the law to get them. Now they have no apartments, but not because they're not done--because they were done in by people who did not follow the law and somehow believed that they had more rights than the next person. Poor person. One squashing the other. My undergraduate degree is in Soviet Economics and Politics. Yes, I am that old. It wasn't history then--it was reality for many. One of my best professors ever, Marshall Goldman, classified Soviet culture at the time like this: "My neighbor has a goat. I don't have a goat. Kill his goat." So the squatters have killed their fellow man's goat. They haven't hurt the government. They've hurt their neighbor.